Another Ghost Rider Debuts on Marvel's Agents of SHIELD! 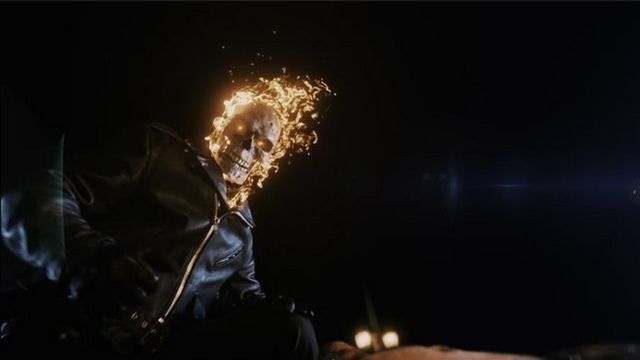 Last night’s episode of Marvel’s Agents of SHIELD revealed the origin of Robbie Reyes as the Ghost Rider, and though a far departure from the comics, it did feature a brief cameo by another Ghost Rider! Though unconfirmed, it would appear this other Ghost Rider was none other than the original character, Johnny Blaze. You can check out the sequence in the player below. It also remains unconfirmed just who played the character and if he will one day return to the series. Created by Roy Thomas, Gary Friedrich, and Mike Ploog, Johnny Blaze made his debut in 1972’s Marvel Spotlight #5. The stunt-riding daredevil summoned the demon Mephisto and sold his soul to keep his father-figure alive. When Mephisto came to collect, however, Johnny was saved by comic book deus-ex-machina and the power of his lover Roxanne’s emotion. In retaliation, Mephisto bonded the demon Zarathos to Johnny and created the Ghost Rider. Marvel’s Agents of SHIELD will return on November 29 with an all-new episode, and you can check out a brief promo below as well. Marvel’s Agents of SHIELD stars Clark Gregg as Director Phil Coulson, Ming-Na Wen as Agent Melinda May, Chloe Bennet as Agent Daisy Johnson, Iain De Caestecker as Agent Leo Fitz, Elizabeth Henstridge as Agent Jemma Simmons, Henry Simmons as Agent Alphonso “Mack” MacKenzie, and Natalia Cordova-Buckley as Elena “Yo-Yo” Rodriguez. Marvel’s Agents of SHIELD airs Tuesday at 10:00 PM ET on ABC.